Jennifer Fackler is experienced in all aspects of litigation, including depositions, motion practice, arbitrations, mediations, settlement negotiations, trial, and appellate practice. Her excellent research and writing skills prove invaluable to clients when it comes to preparing motion papers, which are so often necessary in the litigation context, and the detailed Appellate briefs that are required when a case is taken up on appeal. 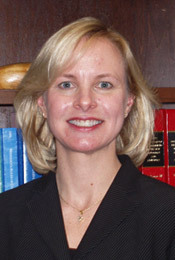 She has written numerous Appellate briefs on cases that have been argued before the Minnesota Court of Appeals and Minnesota Supreme Court. She has also argued cases before the Minnesota Court of Appeals on several occasions. Jennifer is married to Grant Fackler and spends much of her time when out of the office focusing on her three children, when not running marathons. Jennifer volunteers at St. Philip the Deacon Lutheran Church as well as at her children's elementary school.